I think I’m forgetting how to write a blog post. I’ve been away from my kitchen the past two weekends, approved first to New York for a wedding, seek then to St. Augustine for a relaxing weekend. I hadn’t even been to the grocery store in a month! Sacrilege. In New York, I ate and ate – things like delicious Cambodian sandwiches from Num Pang and outstanding brussel sprouts and assorted goodies at Momofuku Ssam Bar. (Not to mention the warm cookies and milk at the Milk Bar next door – awesome on a plate!) In St. Augustine, we found the perfect gelato handmade daily by their gelato maker at Cafe del Hidalgo. But as good as all that food was, I still missed my kitchen. And I’m pretty sure it missed me, too. So, what better way to kick off a week of cooking than with a pork loin roasted with orange and lime juices, garlic and onions? I seared the roast on all sides, then added the other goodies. After about an hour in the dutch oven, the onions and garlic caramelize with the juices and become a citusy, garlicky sauce that’s like pork’s best friend. If anyone out there has a slow cooker, I think this is the perfect recipe for you. Just make sure to sear the meat before you slow cook to release the meaty goodness. ps. You should stuff tacos with these. You just should! Heat a large dutch oven over medium-high. When it’s hot, add the olive oil. Sprinkle the pork loin with salt and pepper on all sides, then place it in the pan, searing it for about 5 – 6 minutes on all sides to get a deep, golden brown crust. Add the remaining ingredients, minus the cilantro, cover and reduce the heat to medium. Cook for 45 minutes to an hour, rotating every 10 minutes or so. It’s done when your meat thermometer reads 160° or the insides are a very pale pink. Remove to a platter, cover with everything in the pan, sprinkle some cilantro leaves over it, and let stand for 5 minutes before slicing and serving. Just read about Momofuku today on another blog, so it’s funny you posted that. Sounds like they have great food! This is a nice way to do pork. Duo Dishes – Momofuku is quite possibly my new favorite restaurant. We got an appetizer called “Bread and Butter” that was a warm and toasty baguette with whipped lardo/smoked paprika and divine black pepper butter. Bread and butter never tasted so good! Mel, that looks gorgeous. And yes yes on the tacos! I did a pork roast in the crock pot recently and stuffed it in tacos. Perfection. Especially with the citrus flavors. Nice one. I’ll be trying it. Over the weekend I did a slow cooker Cuban Pork shoulder roast and made pulled pork sandwiches and then made pork and cheese enchiladas with Green Tomatillo sauce. Damn, it was good. Post(s) to come soon. Thanks for the recipe. If I make and blog it, I’ll certainly link back to you. That golden brown jus is the perfect color. Drool. mmm very nice Mel. This would be nice change of pace for me — I normally marinate and grill/broil loin. Love the flavor profile. Hey there, made this tonight for dinner…absolutely delicious, thank you very much for posting a yummy recipe. I’m on a bit of a low-carb kick and this fitted the bill perfectly. Mine didn’t get quite the colour of yours, think I should have seared it a bit longer. Some very happy diners all the way over in Perth, Australia! 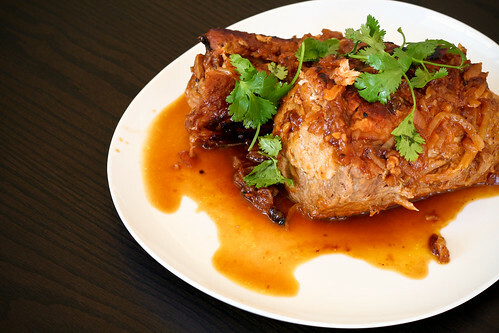 I was just looking for different ideas for roast pork loin this one sounds very good. I am the head chef at the reef and am going to try this sunday for brunch. Made this wonderful dish over the weekend w/ a succotash. Posted it today on my blog.